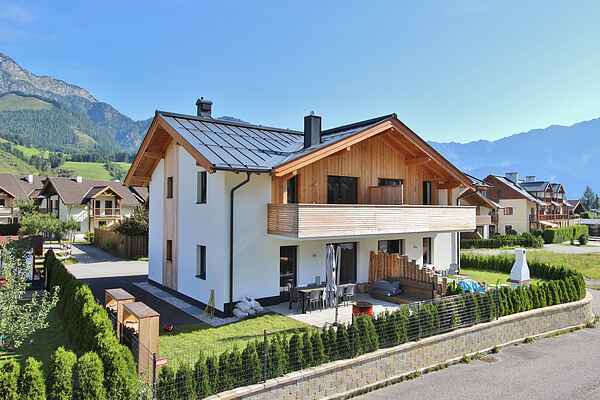 In the well-known town of Leogang, offering direct access to the skiing area of Saalbach/Hinterglemm/Leogang/Fieberbrunn (largest in Austria), you'll find this wonderful holiday home in a sunny location. You'll be staying in the left part of the house, which has a maisonette lay-out. You'll have no fewer than 3 floors at your disposal. The ground floor features a living room with a modern open kitchen, as well as access to a garden with a spacious terrace and attractive lounge furniture. Two bedrooms and a bathroom are located on the first floor, while the third bedroom with bathroom is located in the basement. The bathrooms are fitted with a modern Sun shower. Leogang is one of the most popular destinations in Austria throughout all seasons, due to the large variety of activities on offer. There are lots of opportunities in the direct vicinity for mountain biking, golf, hiking, glacier skiing, paragliding, horseback riding and of course for people who are looking for peace and quiet. Winter activities need no further explanation. The largest skiing area in Austria, Saalbach/Hinterglemm/Leogang/Fieberbrunn, is on your doorstep here.